Disclaimer: I receive a referral commission for the following link(s): Top Cashback, The Discover offers are no longer valid. Google Nexus 7 costs $200 from Google. 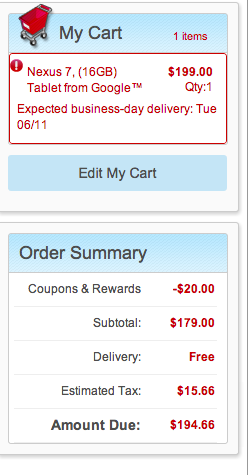 You can buy it for now for $180 from Staples after coupon code 24591 which takes off $20. In addition, you can fill out a rebate for a $20 staples gift card (the second rebate on that page) to use on a future purchase at staples for a final price of $160 or 20% off. Start shopping from Shop Discover online shopping portal and you will receive 5% back as well when you pay with a DISCOVER IT™ Card. You will still get your 1% cashback for everyday spending for a total of another 6% back. 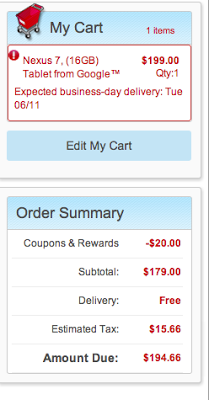 I buy $25 Bed Bath and Beyond gift cards for $20 of Discover rewards so I consider their rewards worth 1.25x their stated value or 7.5% in actual value for this purchase.